The most noticeable benefit of the NGE system is the elimination of the 13-pin plug located on the front of the truck and on the plow. The 13-pin plug, like many things that are used frequently during the harsh winter months, is subjected to a lot of corrosive forces during its duty, which makes it more susceptible to needing maintenance over the course of its lifetime on a plow. Eliminating the 13-Pin Plug reduces time you may spend on maintenance due to frequency of use and corrosive forces on your plow. In addition, it cleans up the installation and the look of the front of the truck. With this system the only plug remaining is the power/ ground connection. 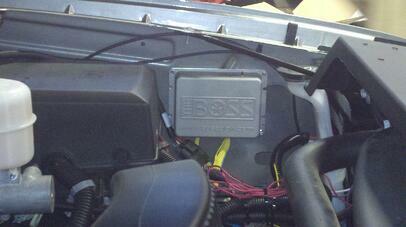 Because the NGE system eliminates the 13-pin plug, this simplifies the wiring of the plow harness on the truck. The system includes a vehicle control module (VCM), and a plow control module (PCM). The VCM is the communication center between the plow, the truck, and the controller. It acts as the “brain” of the operation, providing wireless control of the plow functions and headlights between the vehicle and the plow. With this system, all headlight and plow functions are handled by the VCM, which is installed under the hood of the vehicle. The VCM will auto-detect a plow connected to the truck, turn off the vehicle headlights, and enable the plow headlights without the use of a relay pack under the hood, or a switch inside the cab. In addition, turn signal and parking light functions are now handled without the need for a separate kit. The VCM houses all of those controls and functions and is completely sealed from the elements, protecting it from heat, cold, and moisture making it extremely durable. This system also eliminates wiring for headlights, allowing our wireless system to control not only the plows operations but also the headlights. The elimination of wiring simplifies troubleshooting should a problem occur. The communication between the plow control module and the vehicle control module is completely wireless. The units communicate over a distinct FCC-approved radio band to eliminate any communication disturbances from other sources of RF. During sync, the system establishes a unique signature between the PCM and VCM to ensure there will be no interference from other plows with other NGE systems operating in the vicinity. For fleet operators, this provides the ability to control other plows from the same truck simply by syncing the truck and plow. This feature allows fleets of plows to switch between different plows quickly, efficiently, and with ease. The NGE system also includes the option of a new ergonomic pistol-grip controller (exclusive to the NGE system). The pistol grip controller has 8 positions to control the plow. For ease of use, the pistol grip controller is also equipped with the ability to raise or/ lower the plow and one other direction simultaneously. For example, if you would like to lower the plow and angle it right, those two motions can happen at the same time. 1. One controller for both straight and v-plows. The pistol grip controller can be used for both straight plows and v-plows. The controller allows you to switch between the two plows easily. of inactivity. The factory setting for sleep mode is 20 minutes. You may want the plow to go into sleep mode quicker to eliminate accidentally activating the control while driving between contracts. The new controller will allow the setting to be changed to 20, 15, 10, or 5 minutes. 3. Enable and disable the express ‘rapid up’ feature. This feature gives the power to the snowplow contractor to enable or disable the ‘rapid up’ feature depending on the plowing conditions. For instance, when plowing near soft ground, or pushing snow onto a lawn or landscaping, you may only want to raise the plow a tiny bit to disable float mode and eliminate tearing up the grass. When moving the plow up a little bit, you could accidentally engage ‘rapid up’ (which is engaged by pressing the ‘up’ button twice in quick succession) causing the plow to move up quickly resulting in you possibly losing all of your snow from that push. To eliminate that possibility, the pistol grip controller allows you to disable the ‘rapid up’ feature or enable it depending on the snowplow contract. If you would prefer to stick with the handheld or joystick control options, they are compatible with the NGE system; however, the pistol grip controller is exclusive to NGE and cannot be paired with the traditional 13-pin system. 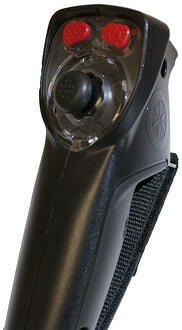 The pistol grip controller also offers reliability and safety features. The controller is tethered to your truck. This means the controller is always plugged into the truck so that you will never have a dead battery on the controller. It will always be charged and ready to go for your next snowplow venture, even when it’s left in a cold truck. This saves you the frustration and time of having to charge up a controller in the midst of a storm. The controller is also tethered to the truck for an added safety measure, meaning you cannot activate it outside of the truck. This eliminates the chance of accidentally activating the controller outside of the vehicle while you or others are standing around or under the plow. If you have a wired system already, you can purchase the next gen kit and switch to the wireless system. The NGE system is available for all 2012 and newer snow plows. The NGE system is currently an option for BOSS snow plows and is purchased separately from the traditional system. By making it optional, we allow you to decide what system is best for you and your snow plow needs.